Governor Chris Gregoire is a product of Washington public schools. She earned her teaching certificate from the University of Washington. She knows that a great education is the cornerstone of success for our children and our economy. Today’s students leave school faced with a dramatically different economic landscape than their parents’ generation. Globalization is transforming Washington to a knowledge-based economy, where employers value critical thinking as well as education and training. Washington’s fastest growing industries, such as aerospace, high-tech and biotechnology, require highly skilled workers with a strong basic education, as well as technical, trade, college and advanced degrees. Yet these companies are struggling to find enough qualified workers. Governor Gregoire believes Washington businesses should be able to find the world’s best-educated workers among our state’s own citizens rather than importing workers from other states and nations. Every child in every community deserves good schools and great teachers. Children need caring families and early preparation to come to kindergarten ready to learn and thrive. Middle and high school students need guidance and support to learn the skills they need to graduate. Today a high school diploma is essential but not sufficient for most good-paying jobs. To compete, more of our students must have access to higher education. We need to make sure that there is enough room for them in our colleges and universities. To build the best education system in the world, Governor Gregoire created Washington Learns to examine our state’s schools and recommend ways to improve them. In late 2006, Washington Learns presented its recommendations to create a world-class, learner-focused, seamless education system to serve as the foundation of the Governor’s education agenda. More than 1 million children in the state attend public schools. For their benefit, we must hold ourselves to the highest standards. We recognize that our competition is not just in Indiana, Iowa or California, but also in India, China and the countries of Europe. Washington is proud to boast of having some of the most talented teachers in the nation. More than 1,800 Washington teachers now have national certification after meeting rigorous standards through intensive study, expert evaluation and peer review. The state expects to nearly double the number of certified teachers in 2008. Only four states added more new certified teachers than Washington in 2007. Washington’s highly trained educators are helping students meet rigorous expectations. More than 92 percent of high school seniors met the reading and writing requirements, up from 86 percent the year before. And nearly two-thirds of high school seniors met the state’s math standards, up from 50 percent in 2007. More and more students are now meeting the comprehensive requirements to earn a high school diploma. Governor Gregoire has fought to bring improvements to our public schools. Students today benefit from smaller class sizes and experienced teachers who received a well-earned cost of living increase, thanks to Governor Gregoire’s commitment to fully fund two initiatives overwhelmingly passed by the voters. We owe our students the tools they need to succeed and excel. Governor Gregoire pushed to invest more than $28 million in additional tutoring for students who need help to graduate on time. Some students choose non-traditional paths through high school. For these students, Running Start has been a popular option. Governor Gregoire supports this program that lets college-bound high school students earn college credit, making their high school education really count. She also champions Running Start for the Trades, a new pre-apprenticeship program for high school students who want their high school education to set them on a path to family-wage jobs in the trades. As a mother of two, Governor Gregoire understands how hard it is for families to afford higher education. She has focused on expanding access to colleges and universities for working families. She accomplished this by helping to boost financial aid by $26.9 million, creating a variety of aid programs, including early intervention and those targeting certain fields, expanding grant eligibility for working families, adding 18,000 new enrollment slots including targeted high demand programs, and establishing four-year programs in Tacoma, Vancouver, Bothell and the Tri-Cities. A location for the new UW-North campus is currently being negotiated between interested parties from Snohomish, Island, and Skagit counties, at the Governor’s direction. Governor Chris Gregoire knows that education is important in every job and is committed to moving Washington’s education system forward. Education is the single most important investment we can make for our children, our state, our economy and our future. If we invest in the best education to prepare students for the future, we all benefit. During the 2007 and 2008 legislative sessions, Governor Gregoire and the Legislature made major new investments in all levels of the education system, from early learning through the K-12 system and continuing through college, job training and beyond. Many of these investments grew out of the Governor’s Washington Learns initiative, which is dedicated to building a world-class, learner-focused, seamless education system. The two-year budget approved in 2007 was designed to fundamentally change educational expectations, delivery and results with a substantial investment at all levels. The budget included an education funding increase of nearly $900 per student in kindergarten through 12th grade and $2.5 billion overall. Institutions of higher education should be safe communities that promote the exchange of ideas and prepare students for careers after graduation. Taking lessons learned from the Virginia Tech and Northern Illinois University shootings, Governor Gregoire made investments in our state’s colleges and universities to enhance campus safety infrastructure and personnel in order to prevent and respond to campus emergencies. 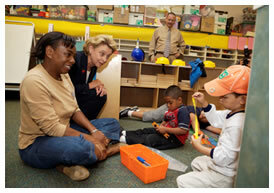 In addition, Governor Gregoire increased accountability for and improve the safety of children served in child care. In 2006, the Legislature granted Governor Gregoire’s request to create a Department of Early Learning to improve high-quality early learning opportunities for young children and their families. The agency is working with its private-public partnership, Thrive by Five Washington, to better serve children from birth to the age of 5 and their parents. The department is carrying out a number of initiatives proposed by the Governor and approved by the Legislature in the 2007 session. These initiatives include providing early learning information to parents and families; developing a quality rating and improvement system for child care; expanding access to pre-kindergarten programs; and improving wages for early learning providers. For the first time, the state invested in voluntary all-day kindergarten programs, starting in our most economically challenged schools. Recognizing that children in kindergarten through third grade learn differently, three K-3 demonstration projects were created to showcase best practices. A major piece of the education investment was Governor Gregoire’s effort to dramatically strengthen math and science education. The 2007-09 budget funded a clarification of our state’s math and science standards, teacher training and development in math and science content and instruction, and more opportunities for students to participate in hands-on science learning. Other key education measures included investments to increase equity among school districts and giving voters the opportunity to lower the threshold for school levy approval from 60 percent to a simple majority, or 50 percent-plus-1 vote, which the voters approved in November 2007. The budget also made additional key investments in programs to support struggling students and students participating in special education programs. The Governor and Legislature took significant funding and policy actions to open college doors to more high school graduates. In particular, the budget created nearly 10,000 new slots for incoming students for 2007-09, including 3,700 targeted at high-demand fields such as math, science and nursing. It also offered more scholarship opportunities, expanded eligibility for grant programs and capped tuition increases at the college level. The budget made additional investments in research programs at state universities with the goal of boosting innovation in fields in which the state has already made critical progress. In addition, the budget directed funding to the Higher Education Coordinating Board to convene interested parties from Snohomish, Island and Skagit counties to consider the November 2007 site options and recommendations for a new campus of the University of Washington in Snohomish County. Local representatives will develop a consensus recommendation on a preferred site by Dec. 1, 2008.